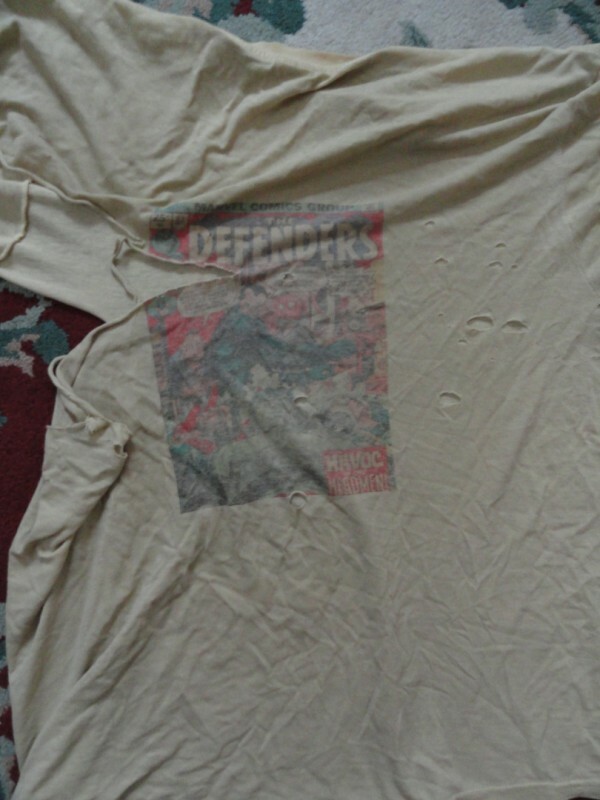 That’s the cover of Defenders #38 on the front; Defenders #33 on the back—a shirt I wore proudly for over ten years. 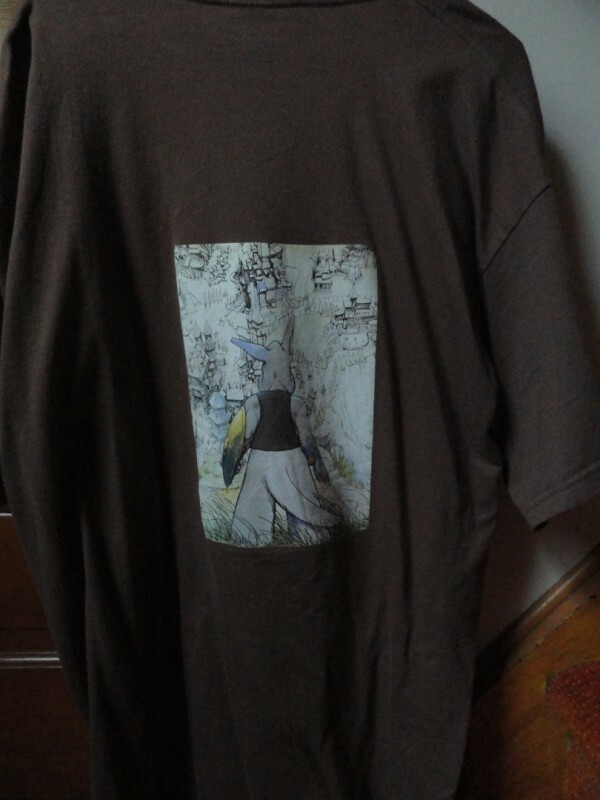 Even when it first started to wear out a couple years back, I continued to wear it as a nightshirt. But as you can see, the poor boy’s deteriorated beyond all hope now. I suppose I could still use it as a dust rag, but why make him suffer such indignity? Better the quick death of the wastebasket. 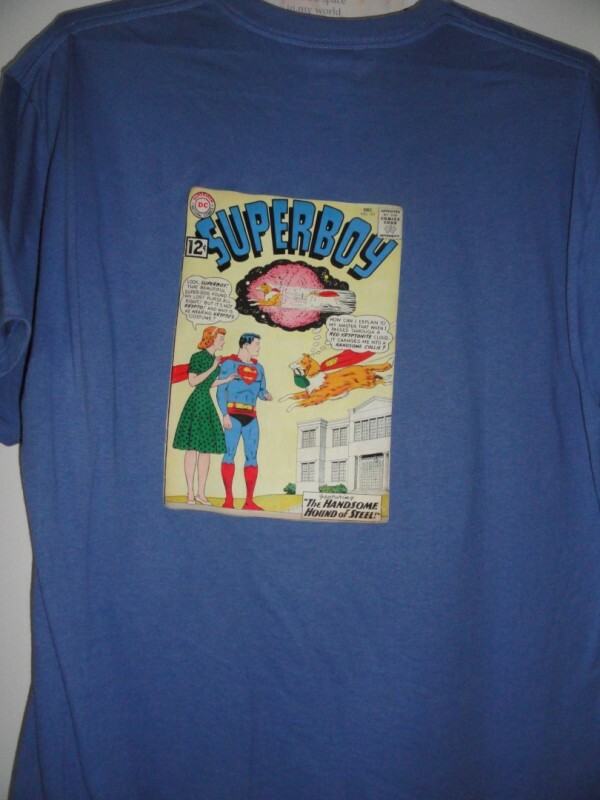 In addition to the classic comic covers it sports, both front and back, this shirt is memorable because it was among the first I ever made for myself back in 2002. There were over a dozen I made that late spring/early summer. I hadn’t anticipated making any more of them after that, but then ideas for new shirts just kept coming—in fact, I don’t think a year’s gone by since that I haven’t made at least one new T-shirt or sweat shirt. It wouldn’t surprise me if I had almost 100 of ‘em at this point. (This is just a guesstimate, of course, as I’m not about to back and try to count them all.) 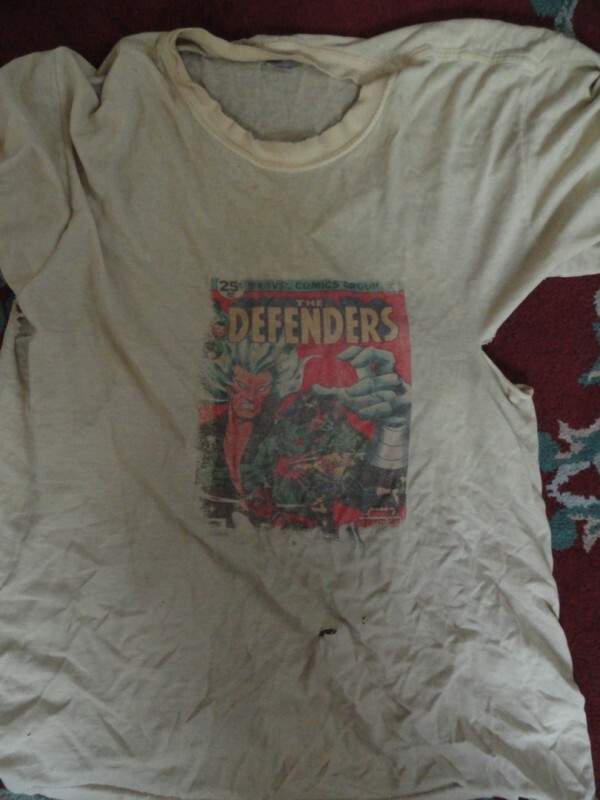 With the passing of my beloved Defenders shirt, it dawned on me that I might as well discuss my T-shirt fascination and share some pics while the shirts are still figuratively breathing. I didn’t buy either of these shirts, nor have I ever seen anyone wearing either of them anywhere. 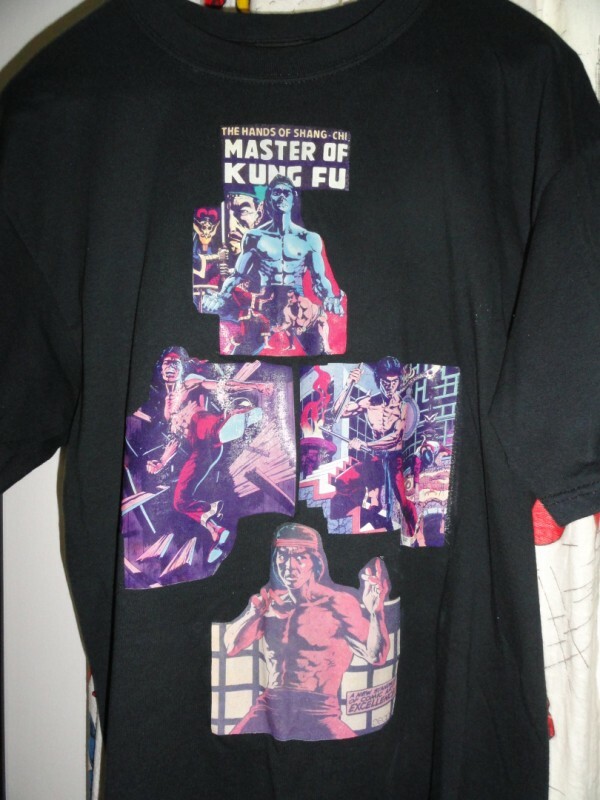 Which isn’t surprising when you think about it, ‘cause those are some odd choices of covers to put on T-shirts. 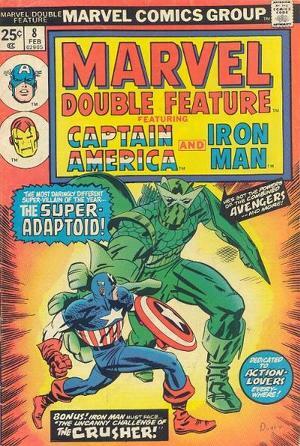 Double Feature was a reprint book after all—why not put the cover of the original book on there? (And the title banner takes up a third of the image, to boot!) 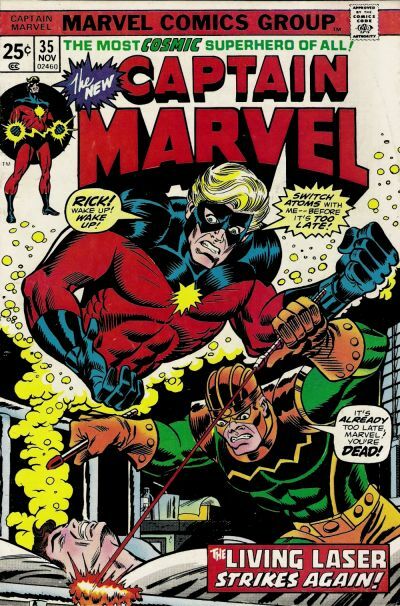 And Captain Marvel #35 is a nice cover, but hardly an ideal candidate for a T-shirt, as it shows Cap in a state of helplessness and does not depict much else in the way of action at all. Any of the Starlin covers from the preceding ten issues would have been a better choice. 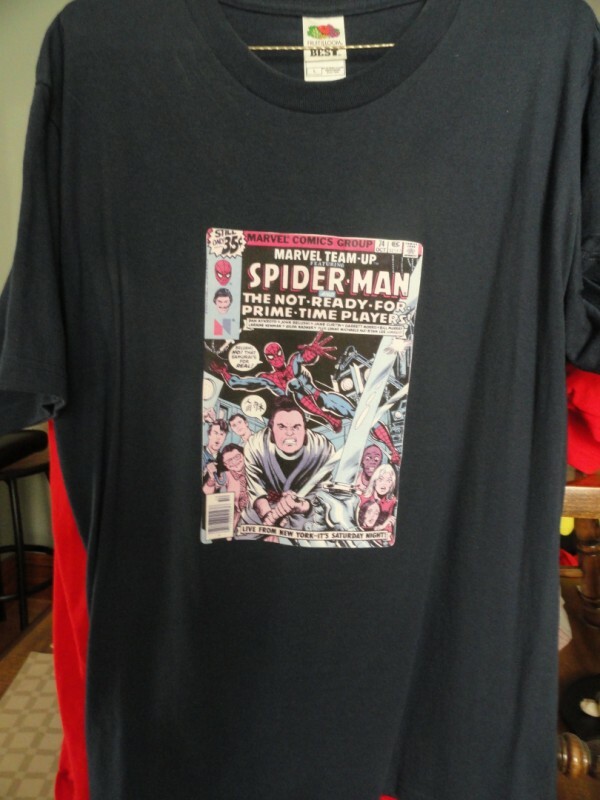 More broadly, why not go with a cover from one of your more popular titles like Spider-Man or Fantastic Four? It’s truly a mystery. Still, a seed had been planted in my imagination. 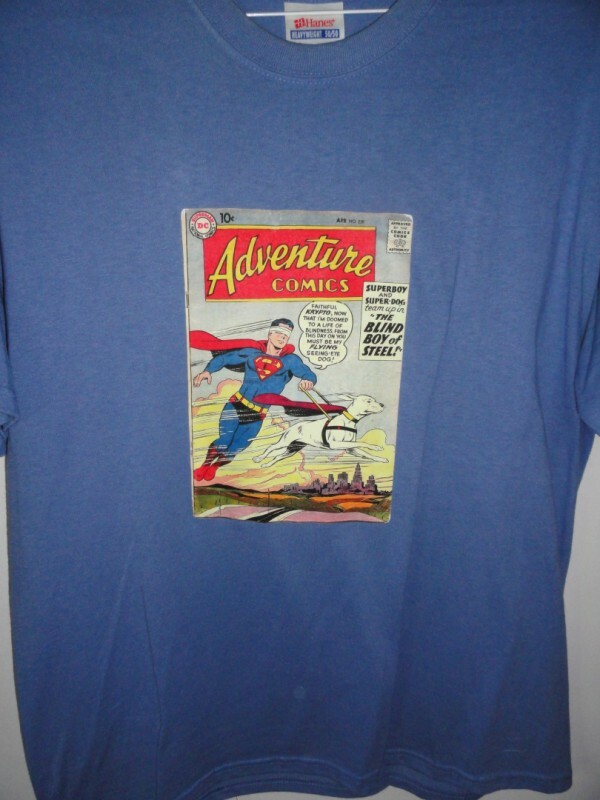 There were so many great, iconic comic book covers that would make great T-shirts. Maybe one day I’d get the opportunity, somehow, to make one for myself. 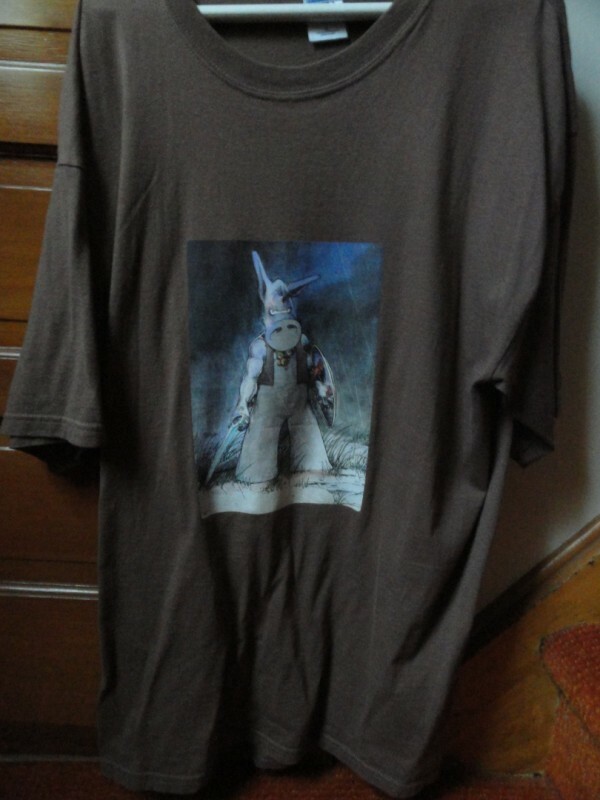 That day arrived when I came across a set of iron-on paper in a craft store sometime circa 2000. 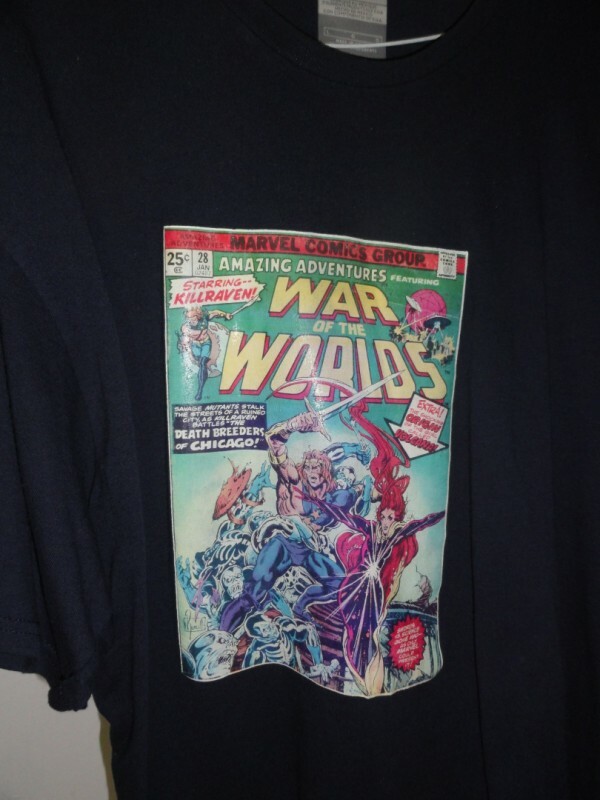 When I saw it, I remembered those old comic-cover shirts and thought I could have a lot of fun making some of my own. I started out picking covers from some of my favorite old comics to use; then it kind of evolved into a mission of using favorite old comics of mine that had been largely forgotten (or ignored altogether) by the general public. 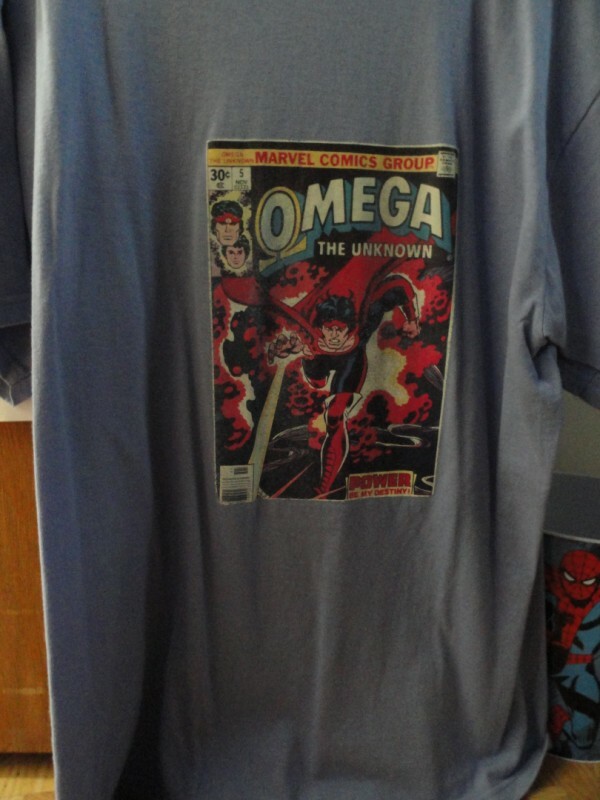 (Which is why I made five different shirts featuring Omega the Unknown.) This was my own futile way of advocating for great comics that were not properly appreciated in their own time. It also did a pretty good job of advertising my own geek cred, as I was almost quite literally wearing it on my sleeve. 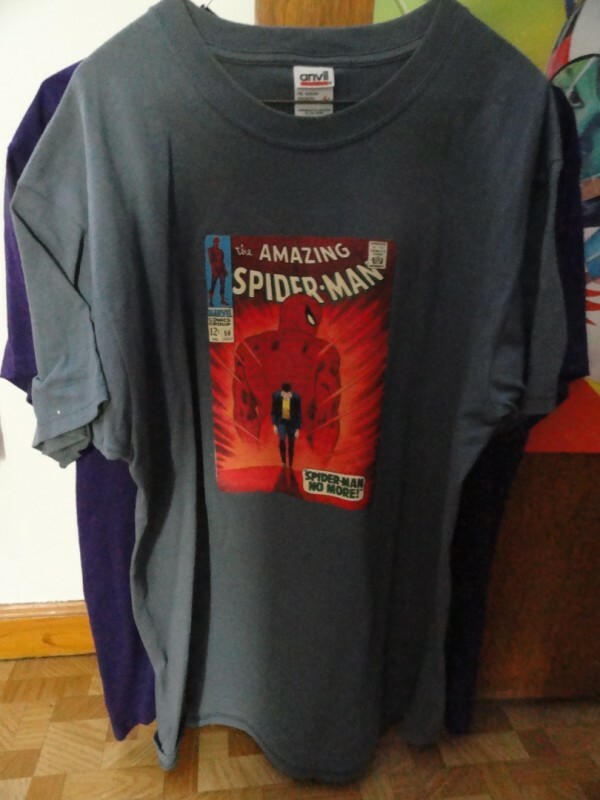 Now when you’re shopping for iron-on transfer paper, there are two types you can get: One type for light-colored shirts and another type for dark-colored shirts. All require an inkjet printer. The light-colored ones you print in reverse (mirror-style) and peel the paper off after ironing. 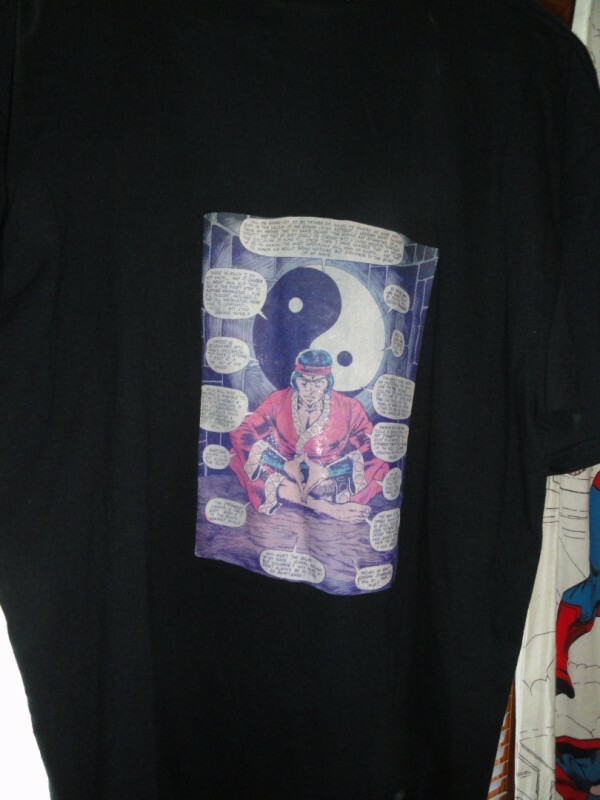 With the dark ones, you print them out conventionally and literally iron them on to the shirt (in other words, the paper adheres to the shirt). 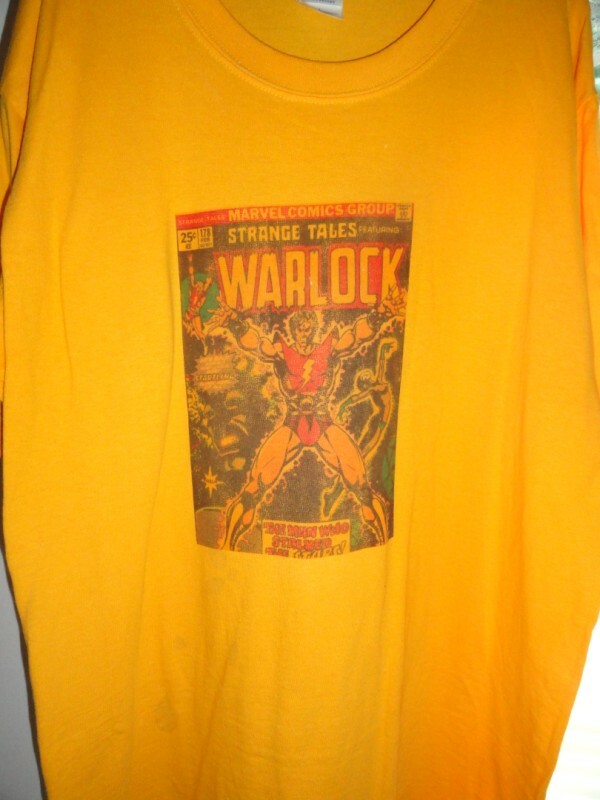 Now I think this effort was aided by the fact that the orange shirt matched Warlock’s natural hue. 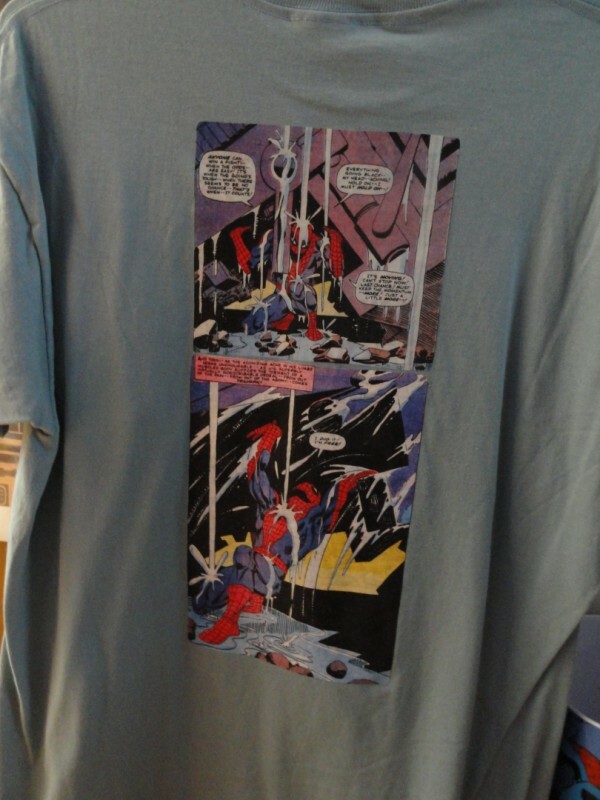 None of the other light-shirt iron-ons looked nearly as good as this one or the Defenders one. 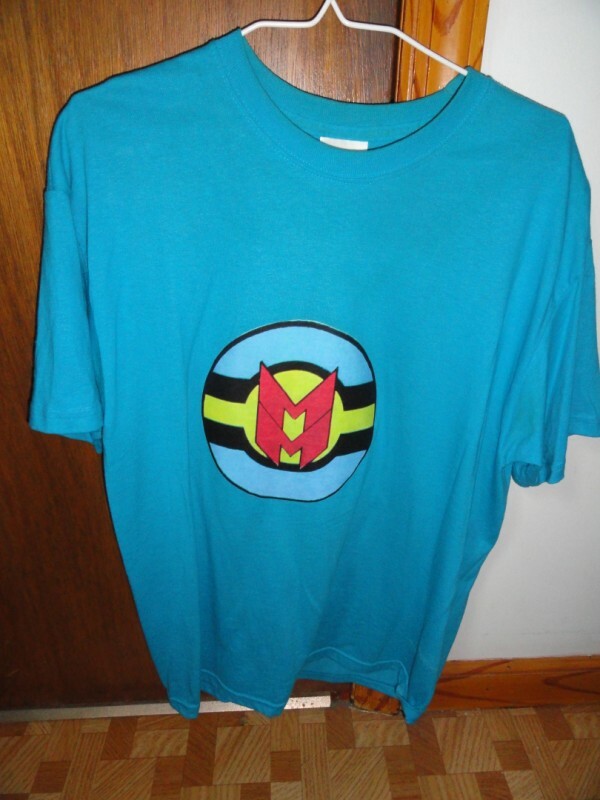 And the dark shirts all came out still better than these and with less fuss, too. 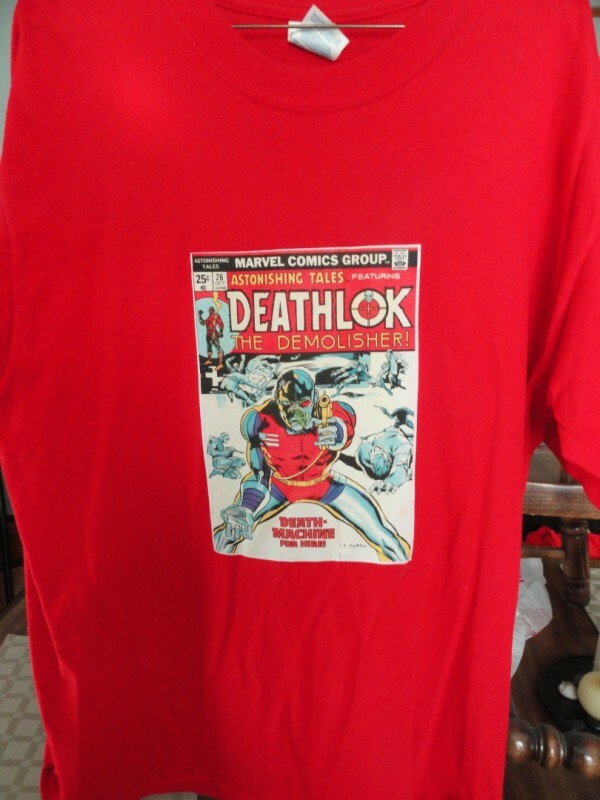 That’s the cover of Astonishing Tales #26, featuring Deathlok. I don’t know if the camera quite captures just how sharp this looks. 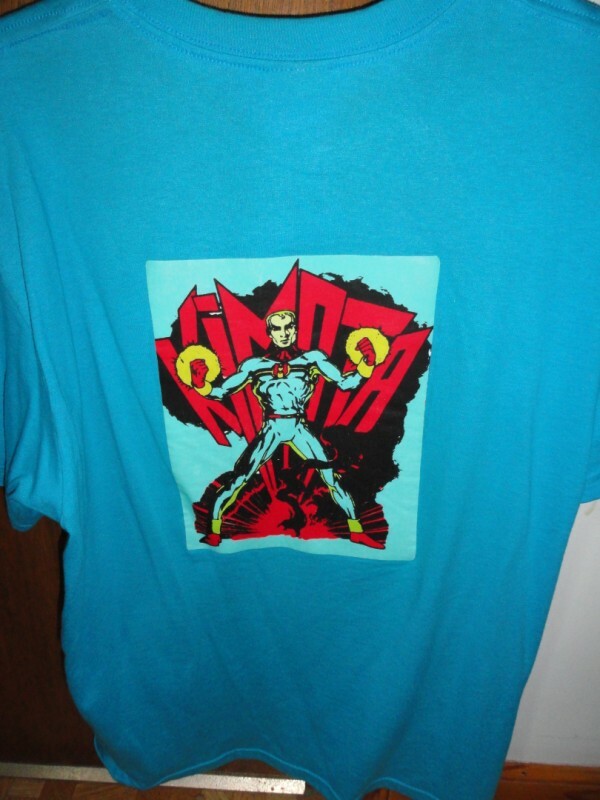 Similar to the Warlock one, I think it’s the red banner on the cover matching the red color of the shirt so perfectly that makes it “pop” so much. Whenever I wear it out in public, it certainly captures the eye of many a passerby. The sketches are by Dave Sim with inks by Barry Windsor Smith, from the front and back covers of Volume #5 of the Swords of Cerebus reprint collection. 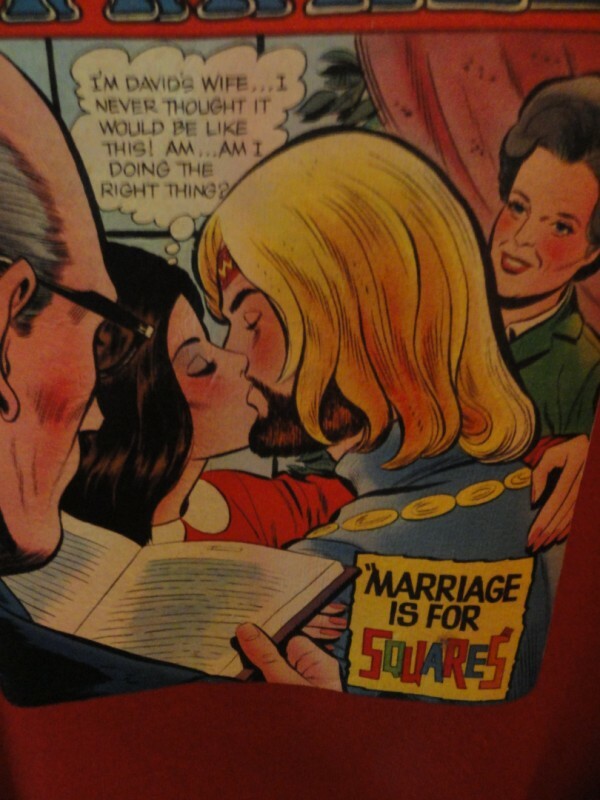 “Marriage is for Squares” still makes me want to giggle like a stupid kid whenever I see it. A classic cover by Gil Kane. 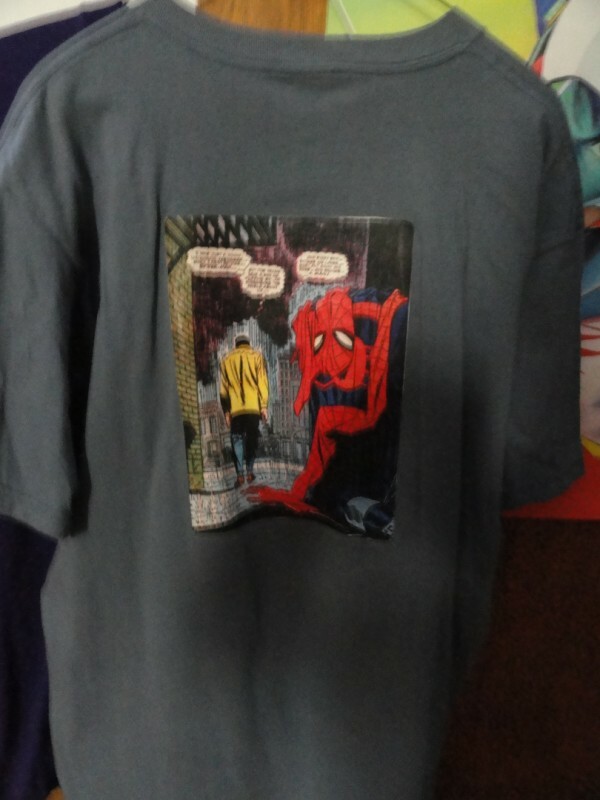 This is actually the back of the shirt—the cover of the first issue of the series is on the front. In hindsight, it probably would have worked better the other way around. 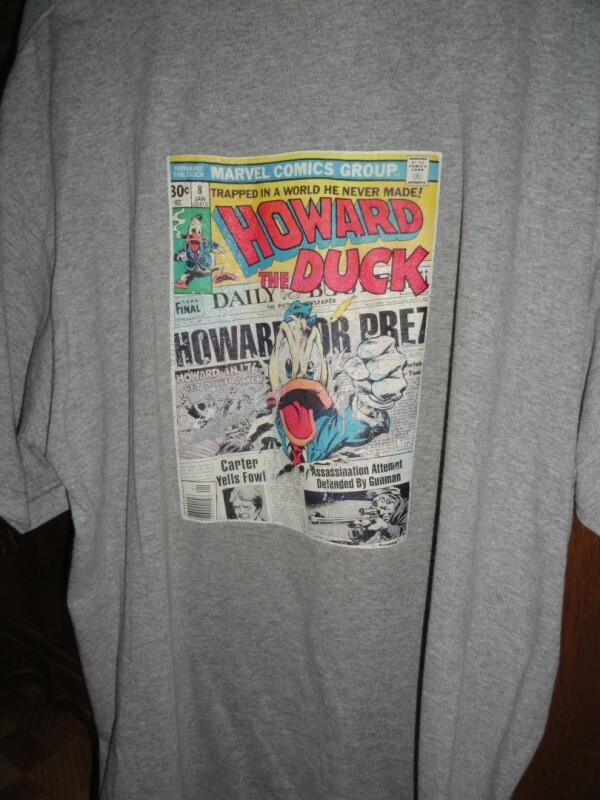 Anyone who knows me would know that a Howard the Duck T-shirt was inevitable. 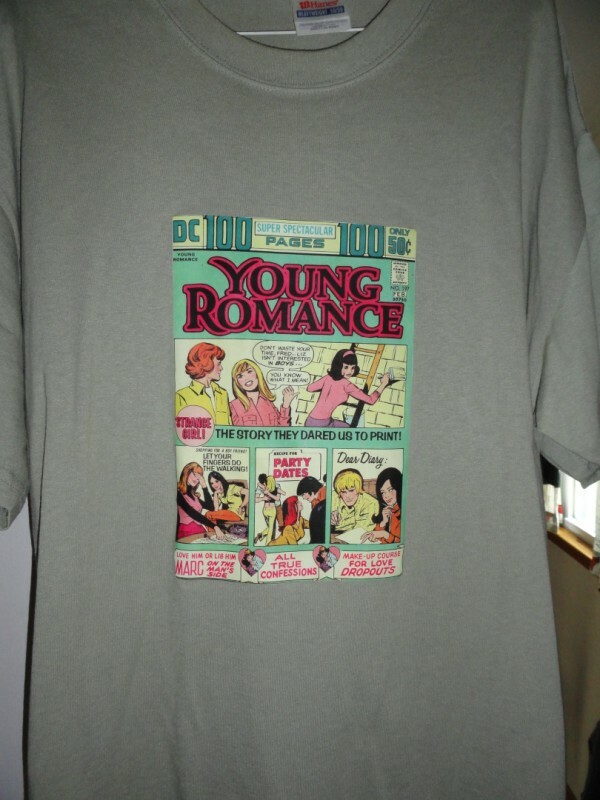 I made several, of course, but this one works best, featuring the cover of Howard the Duck #8, a natural choice for a T-shirt or poster if there ever was one. 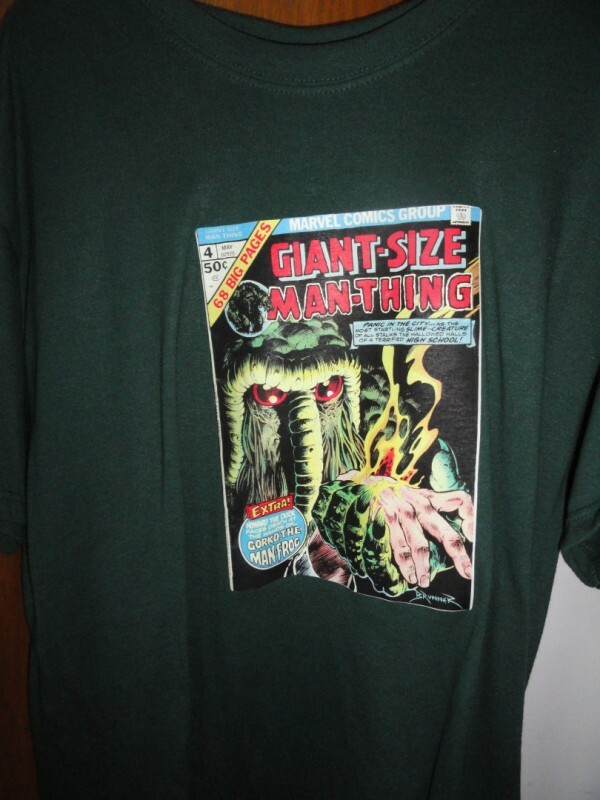 This one was made because I simply could not resist making a shirt for myself that said “Giant-Size Man-Thing” on it. Seriously though, with several issues to choose from, I think this is the best cover of them all—that Frank Brunner art is just glorious to behold. Nothing screams geek cred like the Legion of Super-Pets! 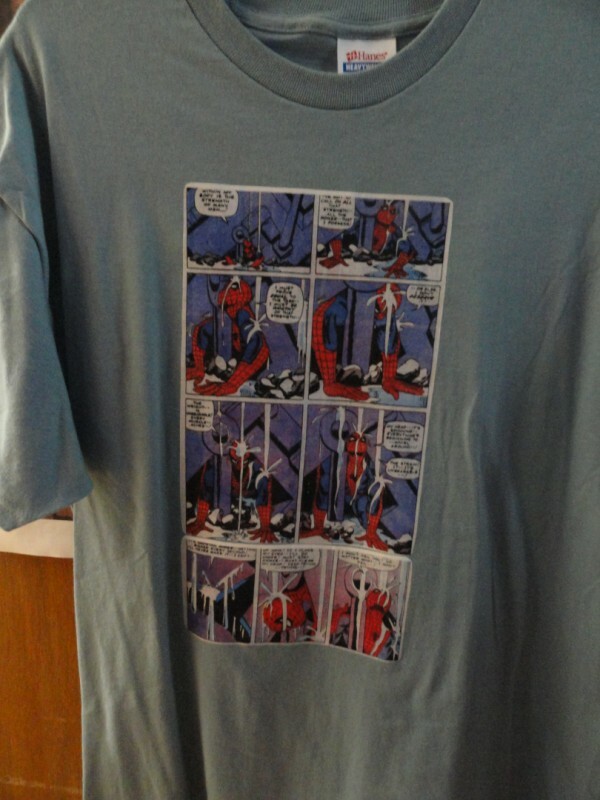 Another favorite shirt of mine. 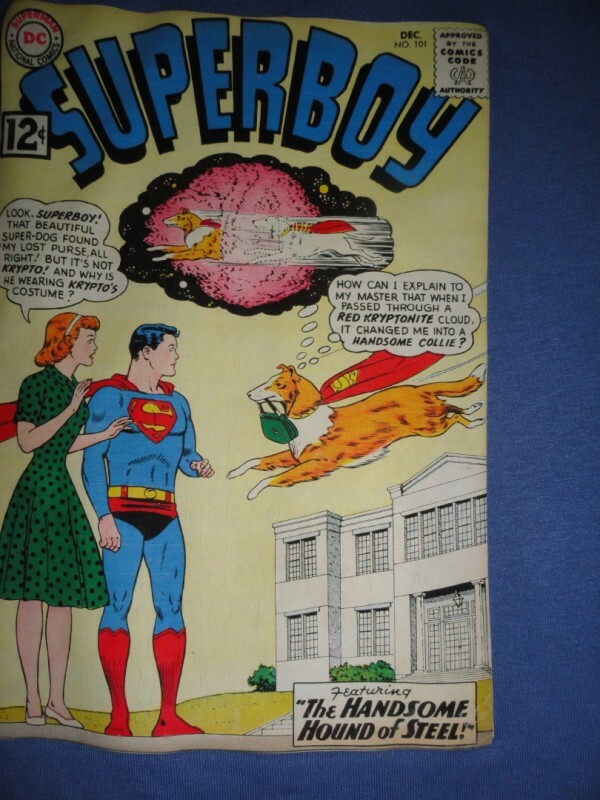 In case my love of Krypto the Super-Dog wasn’t clear, here’s another that features him front and back. 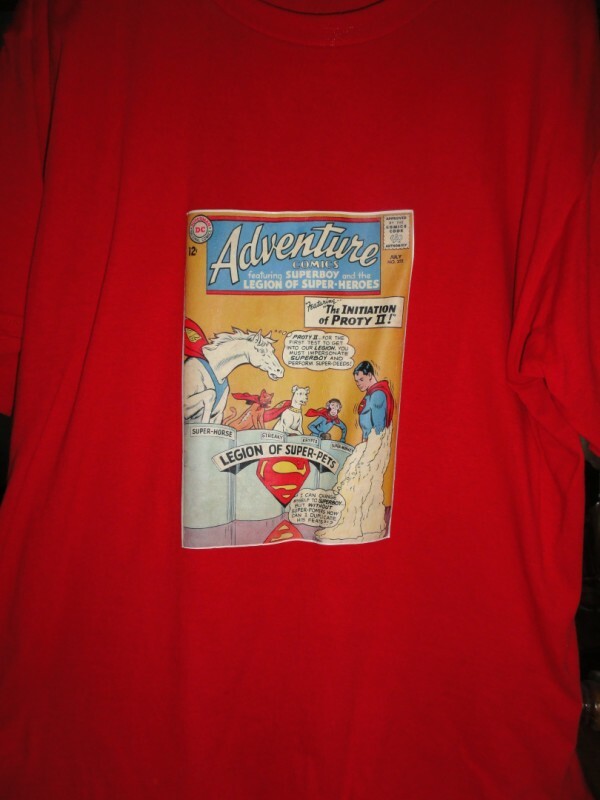 Front is Adventure Comics #259, back is Superboy #101. 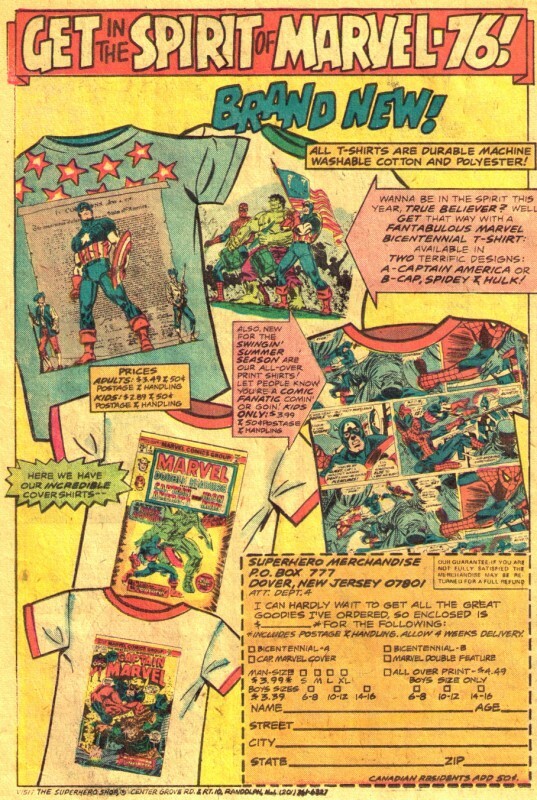 A theme shirt featuring the cover of Marvel Team-Up #74 (cover date Oct. 1978) on the front and Avengers #239 (cover date Jan. 1984) on the back. 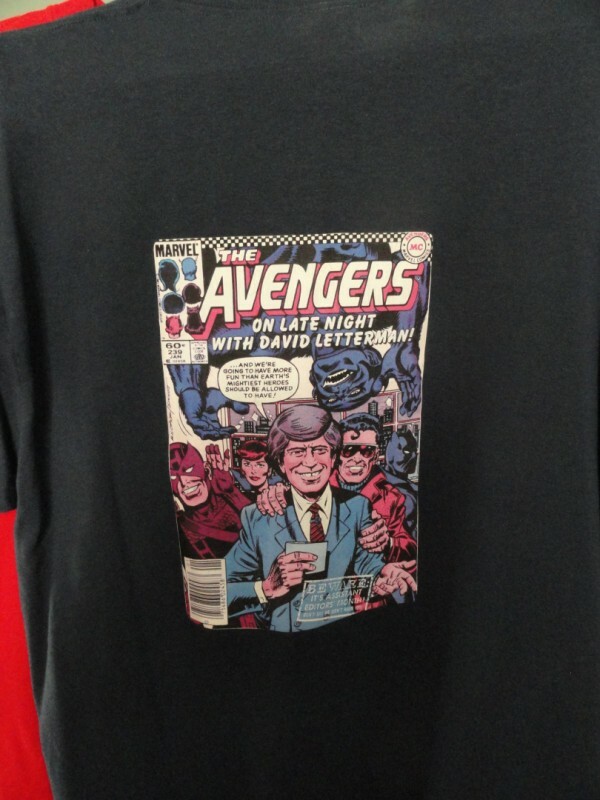 The theme, of course, is classic late-night TV shows in comics. Both issues were also pretty fun reads. Yeah, okay, so this one was for comedic value. 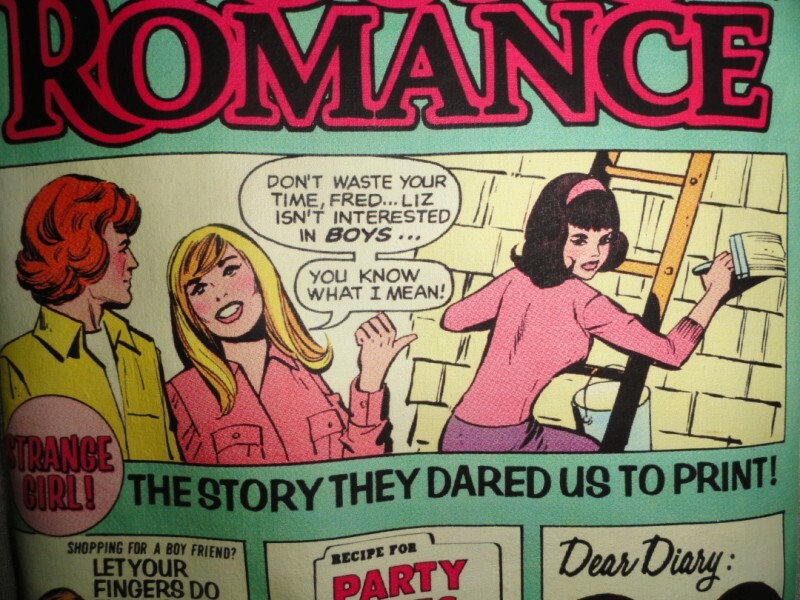 This cover of Young Romance #197 (cover date February 1974) featured lesbian innuendo that was actually kinda bold for the early 70s. 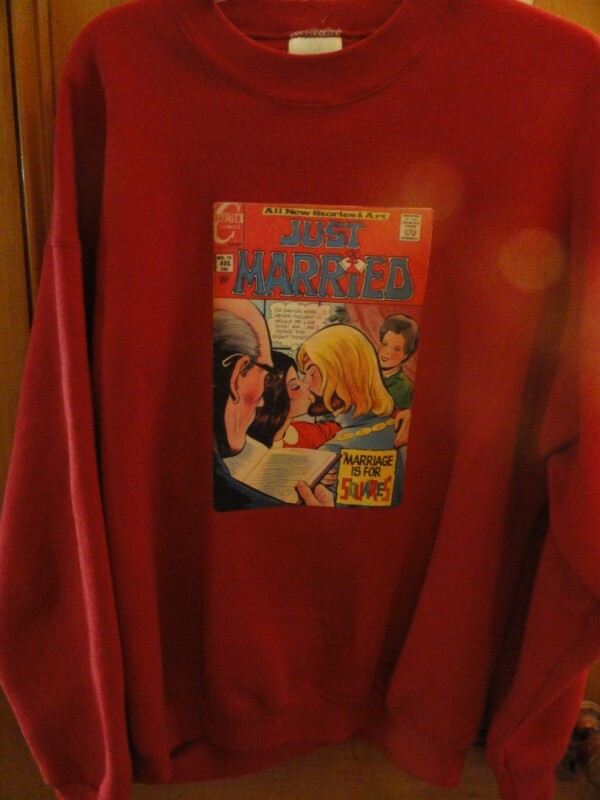 Of course, the actual story had no homosexuality of any kind—Liz was just ever so slightly tomboyish and just waiting for the right guy to come into her life (which he did by story’s end, naturally). I have more but I think this truly is the cream of the crop. At some point in the future I might do a post on my denim jacket—or as I call it, my “Technicolor dream coat.” It’s only slightly comics related, but it’s quite a sight.